IMI Truflo Marine are one of the great British engineering success stories based in the heart of Birmingham. I’m proud to have been the lead in their marketing and re-branding efforts, preparing them for their next chapter. Part of IMI plc’s IMI Critical Engineering group, IMI Truflo Marine design and make high-integrity ball valves for the civil nuclear and defence marine industries. Truflo Marine, as they were initially known, are proud to have worked on valve solutions for HMS Dreadnought, the UK’s first nuclear submarine and also the installation of valves on some of the first nuclear power stations to be commissioned in the British Isles that are still in service over 40 years later. Over the last half-century, IMI Truflo Marine have accumulated a wealth of experience in providing high integrity valves and actuators for use in critical and severe service applications. IMI Truflo Marine maintain a huge database of valves and spares kits supplied for critical and severe applications over the past 40 plus years. The biggest benefit of such a large, specialised database, is that IMI Truflo Marine can produce new kits for obsolete parts and have an amazing library to refer to when creating new bespoke items. Producing Ship and submarine valves since 1962, IMI Truflo Marine have a rich history, yet have always operated from the same site in Witton, Birmingham, since Wilmot Breedon established the original company in 1962. Originally, Truflo Ltd made valves for the oil and gas market as well as for the naval marine market. In 1994, then owners Charles Baynes plc decided that Truflo Marine should focus on the naval marine industry. Charles Baynes plc was renamed FCX International plc, and quoted on the London Stock Exchange until a management buyout in July 2002 created a privately owned group of primary flow control distribution and manufacturing companies in addition to a Truflo International group. The Distribution Divisions of FCX International’s primary flow control distribution and manufacturing group were sold off in 2005, but the Truflo International group remained to focus solely on the specialist manufacture of valves, instruments and related flow control products. In May 2006, the international engineering business IMI plc bought the Truflo International Group in a deal worth £113m and Truflo Marine became part of the Nuclear division of IMI plc. IMI is a dynamic, worldwide engineering company delivering innovative solutions to leading customers in clearly defined niche markets. Today, Truflo is part of IMI plc’s IMI Critical Engineering group, having completed its re-brand in 2016 and is very much a low-volume producer of highly specialised valves and solutions for some of the world’s most safety critical applications. Truflo Marine’s pioneering work on HMS Dreadnought, the UK’s first nuclear submarine, was the beginning of a series of innovations for Britain’s Royal Navy and many other navies worldwide. The list now includes state-of-the-art Astute Class, described as “more complex than the Space Shuttle”, as well as the Vanguard and Trafalgar Class submarines. IMI Truflo Marine now proudly leads the World in the design, manufacture and supply of submarine and ship valves, with over 100,000 valves currently in service with over 20 navies worldwide. The first valves IMI Truflo Marine supplied to the nuclear industry were installed in Britain’s Heysham 2 and Torness nuclear power plants in 1975. Since then, IMI Truflo Marine have supplied thousands of valves to nuclear power generation customers across the world. Due to the highly specialised and bespoke nature of producing valves for the latest nuclear submarines and critical valves on nuclear power stations, IMI Truflo Marine found themselves both in IMI plc’s Critical Engineering group and as a specialised valve producer within that group. IMI Truflo Marine’s highly experienced team of design engineers are experts at providing custom-made solutions to suit the specific needs of their customers. To back up their bespoke design expertise, IMI Truflo Marine also have a highly trained team of manufacturing staff and vigilant quality assurance team, who ensure that the products supplied have been manufactured to the highest possible standards, fully tested and validated, and come complete with detailed documentation providing full traceability. IMI Truflo Marine are committed to achieving the highest standards, maintaining that high-bar through continuous improvement. ISO 9001 and 14001 accredited, IMI Truflo Marine put these acreditations to good use very day, building on old systems, to deliver consistent small changes to improve quality and/or efficiency. Rather than just achieving ISO accreditation for a certificate to hang on a wall and numbers to add into email signatures, IMI Truflo Marine are constantly learning from what they did yesterday and improving on it today to make a better tomorrow. At the end of 2013, Truflo submitted an entry to the Severe Service Awards Process. Severe Service being the IMI platform to which Truflo were part of at that time, before becoming a brand under the Critical Engineering umbrella. In March 2014, IMI Truflo Marine won award in recognition of their outstanding commitment to the IMI Way. IMI Truflo Marine had greatly impressed the Severe Service Awards panel and Managing Director Clayton Manley, was presented with a trophy at the Severe Service Leaders Conference. The award was presented for work undertaken in Continuous Improvement and work in support of the IMI Way, particularly IMI Truflo Marine’s continued commitment to their community partners John Taylor Hospice & Support our Soldiers. IMI Truflo Marine Were awarded ISO 14001 accreditation in 2008. This accreditation covers all environmental aspects of the manufacturing processes and extends to the environmental impact of IMI Truflo Marine’s routine operations. ISO 14001 accreditation is a way for IMI Truflo Marine to pro-actively identify and nullify any potential environmental risks that may arise as part of their normal business practices, before any negative impact arises. Often referred to as Corporate Social Responsibility (CSR), IMI Truflo Marine take their responsibilities to the environment and the communities in which they operate very seriously. IMI Truflo Marine maintain high standards of responsibility, placing particular emphasis on ensuring the management of social, environmental and economic issues is aligned and integrated with the overall management of the business. 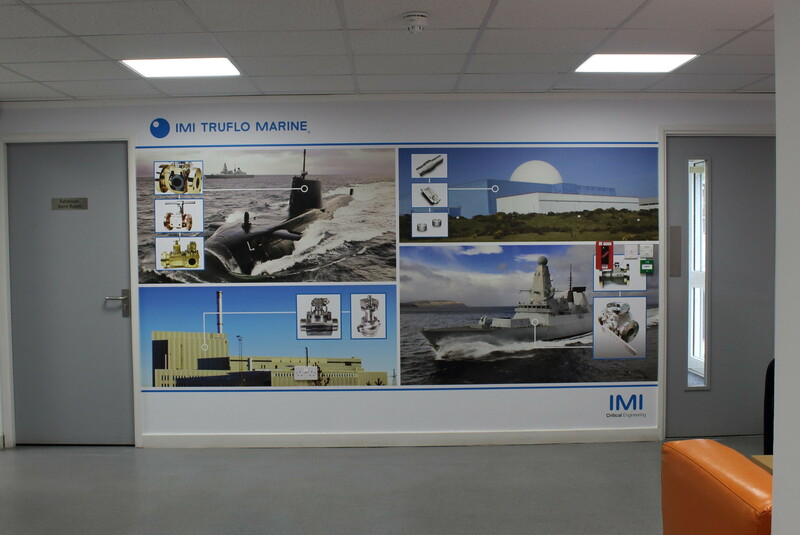 As part of the IMI group of companies, IMI Truflo Marine follow the group ethos, which is a guiding light to help all employees consistently demonstrate their commitment to The IMI Way. Every employee is a leader and works towards a guiding set of values that exemplify how they should all behave. Business plays an integral and influential participant in society and IMI Truflo Marine recognise this, taking steps to encourage and support projects and activities that strengthen the communities in which their employees live and work. As a result of these commitments, IMI Truflo Marine have been able to support primary schools, local football teams, choirs and other inspirational causes, all less likely to secure donations through national campaigns. The great benefit of this is that IMI Truflo Marine are able to retain a healthy emotional connection between their business, its employees and the wider community.